Wow! I actually did it! To be honest, I’m a bit surprised! I am very good at starting things- but not so good at finishing them. 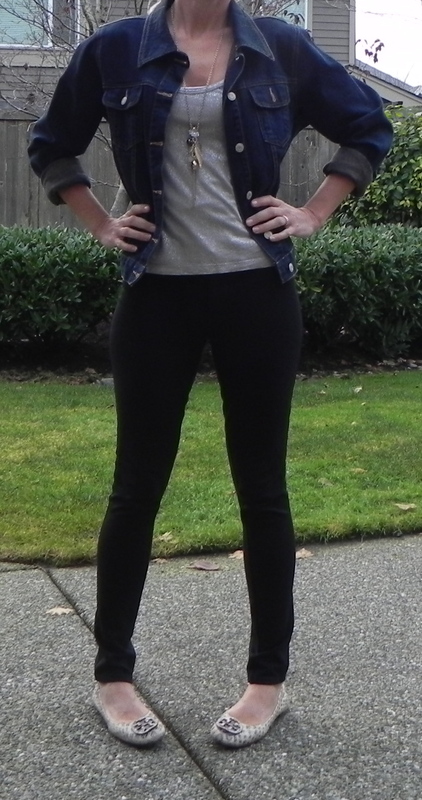 Here is a summary of what I wore for my 30 for 30 Challenge. To see the slideshow, click on any picture and it will take you to the larger images. I sure wear my skinny jeans a lot. I am so surprised that I only wore my pencil skirt once! It’s appropriate for work, but seems a little dressy for ‘everyday’ moms. I think a skirt with a brighter pattern, or a bright solid color (I’m thinking red)- would have been a bit more fun. A pair of cropped cargos or khakis would have been a nice alternative to my jeans. I’ve learned I actually like having my choices narrowed down- it made things so much easier getting dressed each morning! On that same note- I’ve also learned that I don’t need so many items in my closet- most don’t get worn anyway. I think the biggest lesson I’ve learned is that I’m going to stick to investing in quality, classic pieces- not buying so many cheaply made items from places like Old Navy, Target, H&M and so forth… Those stores are fun for ‘fast fashion’ (as my friend Heidi told me), but I’ve learned my style is classic, not uber trendy, so I don’t need to be wasting money on those type of items (although every now and then a fun trendy piece paired with something classic is great!). I’m very glad I did this 30 for 30 Challenge, and will probably return to it again this summer (bet it’s a lot easier with summer clothes!). Dec 30th, 30 for 30- Day 30!!! December 30, 2011 December 30, 2011 by Megan2 Comments on Dec 30th, 30 for 30- Day 30!!! 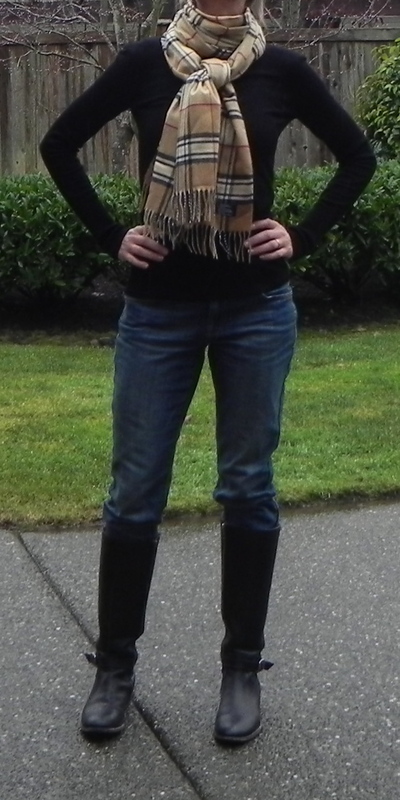 I’ve saved the best for last… not really, but this is definitely one of my favorites and it’s my ‘go to’ outfit. It’s classic, simple and very easy. I wear this when I’m volunteering at school, or out shopping, or to casual day at work, out to dinner with friends… it’s always appropriate and stylish. 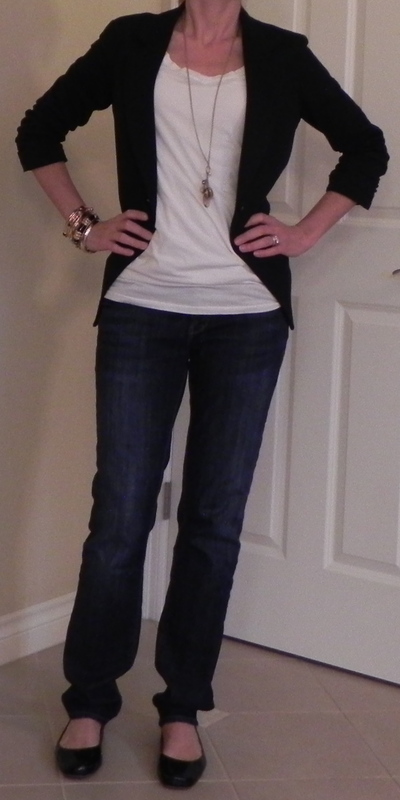 I’ve simply paired my dark jeans with a white tank, my black blazer and black flats. For interest and personality, I’ve added a necklace and a stack of bracelets. I happen to like it plain, but changing the color (or adding pattern) to the tank is another great way to add style. Nothing too exciting, definitely not cutting edge- but it’s me! I’ve linked to Fashion Friday– check it out for some great ideas! Today’s outfit is a bit of risk- and to be honest, I’m not sure how I feel about it! While I was tempted to pair it with my black turtleneck- as I did here– I figured we have all seen enough of the black turtleneck. To keep to my rule of three (3 items of interest in the top half of my outfit), I then decided to throw on my denim jacket and this cool necklace my hubby got me for Christmas. Now for the bottom half- since it is winter- and my legs were frozen- I knew I needed tights. I figured black was too dark (and since I’m wearing blue didn’t want to mix the two), and cream was too light. Hence, the grey tights. Luckily I’m going to the movies today- so even if this is a total bust, in the dark no one will see me! 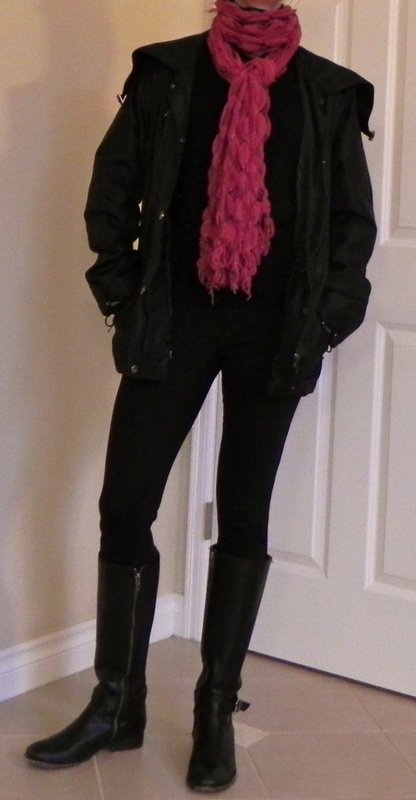 Work it Wednesday– today’s theme is my ever favorite- the black turtleneck. I’ve done this before, (here) but thought it’d be fun to try again today, especially since my choices are so limited. My first look is my Rachel Zoe inspired, night on the town, all black with faux fur. I like the way the necklace picks up the color in the fur. My next look is more of a daytime look- I’ve added a cute jacket and bright scarf. This jacket works well because it has elastic at the waist, which helps define my middle- and doesn’t let the jacket overwhelm me. Perfect for a cold and rainy day- like today! My 3rd look is another daytime look. I’ve paired this oatmeal sweater with this gorgeous scarf, added some thick wool socks (scrunched down) and these cute boots. Love these shoes with this sweater! Looks like they were made to go together. This outfit is all about the gold scarf. Return of the grandpa sweater! As you can see, my black turtleneck is probably the most versatile piece I own. Since I’m always cold, it works well to keep me warm, and acts as a base for me to add items to. Which of these looks is your favorite? Any?! Another very late post, I apologize! I have to admit I’ve enjoyed my lazy mornings, lounging around in my jammies though! 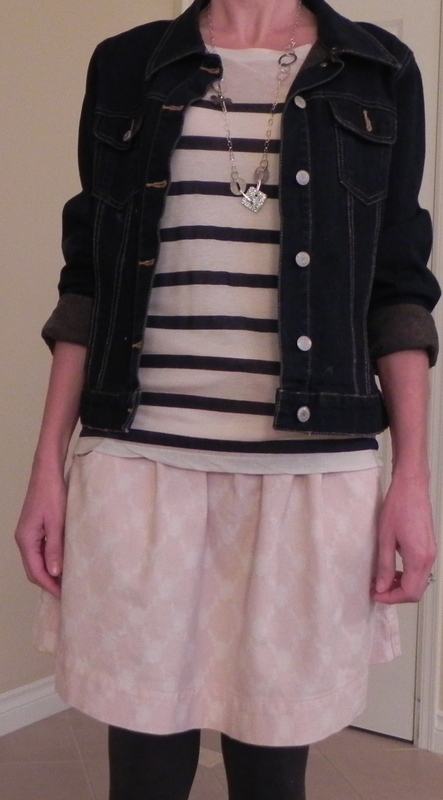 I need to run a bunch of errands today, so I finally got dressed- and this is what I chose! My boyfriend jeans (rolled at the ankles for style), my leopard flats (you know how I LOVE leopard), this eggplant colored- draped top and my cream cardigan to top it off. My piece de la resistance is this cute Jewel Kade necklace. I love the way it ties all the colors in together. Love the bee on this necklace- on the back is the message, Be Yourself! Now off to fight the crowds… wish me luck! I’ll be honest, I am looking forward to the end of this Challenge. I’m getting a little tired of these same clothes- and I bet you are too! 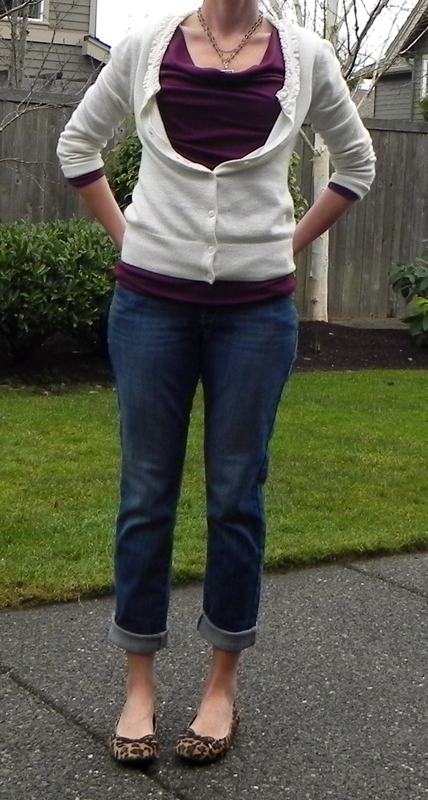 Today I’m wearing my skinny jeans (they look black in the photo, but they are actually blue denim). I’ve paired my jeans with this bluish/ grey sweater with the asymetrical hemline. To add a little color and style- I’m wearing this gorgeous silk scarf. I’m wearing it ‘rock star’ style, (a name I just made up) but it kind of reminds me of Steven Tyler a bit. Not that I want to look like Steven Tyler… at least I don’t think I do?! As for my shoes, I’m wearing these steel grey wedged heels. 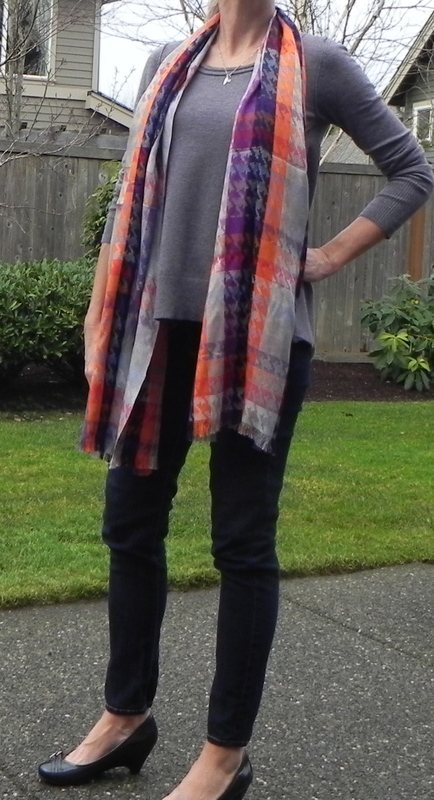 It’s a different look for me- normally I wear either ballet flats or boots with skinny jeans- but I decided to try something new. What do you think? Hit or miss? I love the orange in this scarf! Such an upbeat color! I want to be very comfy since we will be laying around all day opening gifts and hanging out. These cream cords are like sweat pants! So warm, so soft, so stretchy. Perfect for a big Christmas dinner. I’ve paired them with my black turtleneck, pearls and ballet flats. A simple and classic outfit. To add a little pizzaz, I’ve added my leopard belt. Now, go enjoy your family!